Yes, in honour of our next release, we figured we’d run a competition. Try to stay calm…. At the end of August, we’ll be launching the latest in our collection of highbrow, intellectually stimulating and ideologically challenging comics. That’s right, folks, SENTIENT ZOMBIE SPACE PIGS is nearly here! 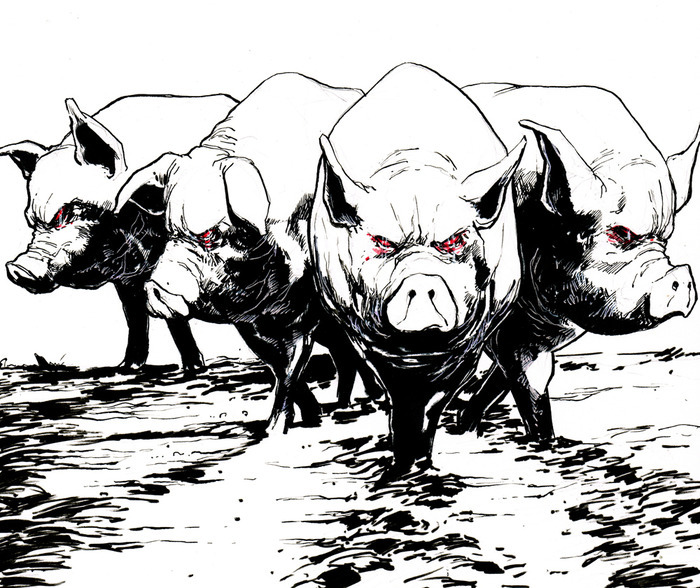 Meet Uncle Harlan and his family, the FBI, the media, some very angry pigs in Issue 1 this August. Here’s your chance to win a bunch of stuff! What to do? We have always been impressed by comics and books that have marvellous quotes on them to tell you how good they are. “A tremendous piece of work!” “A bold new direction for comics!” “Not bad!” – that sort of thing. We’d like you to provide us with a quote. Two conditions: one, you don’t get to read the comic first (!) and two, it must feature a pig-based pun. The top three quotes will feature on the back cover of SENTIENT ZOMBIE SPACE PIGS and win a signed copy of Issue 1 of SENTIENT ZOMBIE SPACE PIGS. Our favourite quoter will also win a character sketch from the comic by our artist extraordinaire Conor Boyle. How to enter: simple – add a comment to this blog or enter via Twitter to @DisconnectedPrs. Closing date: noon on Monday 12 August 2013. Spread the word. The SENTIENT ZOMBIE SPACE PIGS are coming!